A set of videos showing various techniques in Art and Stitch. You can watch those video lessons online at your own time, your own pace, replay as many times as you like. The videos have voice-over as well as subtitles (captions). A printable class handout with step by step descriptions of the techniques. The finished designs created in the videos. Scroll down on this web page to see the class descriptions. 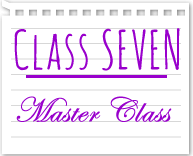 Click on the Buy Now button for the desired class(es). When done, complete the payment. After your payment you will receive a Receipt of your Payment by PayPal as well as an email with your Class Login details. Important Note: the email with your Class Login details is automatically sent to the email address used for the PayPal payment, so be sure to check the Inbox of that email account. In Stay @ Home Class ONE you will learn how to use the Line and Bezier tools in Art and Stitch. Learn how to turn the drawing into a Creative Fill, enjoy using a special distort trick with a surprising result. Learn how to use the Bezier tool to make a Motif fill, to create a quick useful loop with just 4 points and turn the loop into a frame. This class includes 5 videos, 9 designs in the vector ANS format and a class handout describing the techniques. In Stay @ Home Class TWO you will learn how to trace a background image in Art and Stitch. You will be using the Magic Square tool, learn how to tie objects together, work with the Repeat tool. 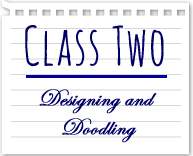 You will learn a wonderful way to let your customer draw her own design and create a pattern based on that "doodle". Learn how to make flower elements than can be inserted anywhere. Get an insight in the designing process of assembling separate objects into a continuous design. This class includes 9 videos, 11 designs in the vector ANS format and a class handout describing the techniques. 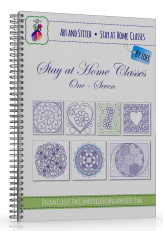 In Stay @ Home Class THREE you will learn how to create the very versatile Meandering Anything designs. You will use the Power Copy function, but also fill a special Meandering Anything template (included in the set of designs for this class) with different theme-based objects and turn everything into a continuous repeatable pattern. Learn a new trick to fix the stitch direction. Learn how to create interlocking designs and get the professional look you find in the online Longarm quilt pattern shops. Class THREE includes 8 videos, 10 designs plus 3 templates/elements files in vector ANS format, and a class handout describing the techniques shown in the tutorial videos. admire your skills! As with all classes, the Designs and Class handout are included. Apart from the Sampler made in the videos there are two extra bonus Samplers included with this class: the templates as vector artwork and also the versions ready to send to your machine. 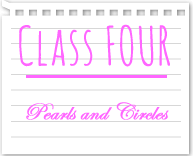 Stay @ Home Class FOUR will teach you how to create pearls, strings of pearls, circle fills, foam. Several techniques will be taught to draw the pearls to start on one side, end on the other side, or start and end on the same side - all depending on how you are going to use the design element: as embellishment to be inserted in a design, or as part of a design, to travel from one side to another side. Pearls are always beautiful in a quilt, so you don't want to miss this class! 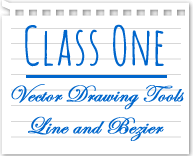 Class FOUR includes 10 videos, 18 designs in vector ANS format, and a class handout describing the techniques shown in the tutorial videos. Filling large spaces - that’s what the Creative Fill function can do. 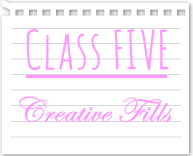 Learn all about the artwork based Creative Fills. How to use Creative Fills inside and around a shape - use fills from the Library, or use your own from previous classes. Learn how to make your own Creative Fills. Learn how to make a closed shape repeatable and use it as a base for a creative fill. You will also learn a special technique to make background fillers: continuous paths to be used around a shape (leaving the shape open). Class FIVE includes 12 videos, 19 designs in vector ANS format, and a class handout describing the techniques shown in the tutorial videos. This class is about using the Motif Fill stitch type for longarm quilting. 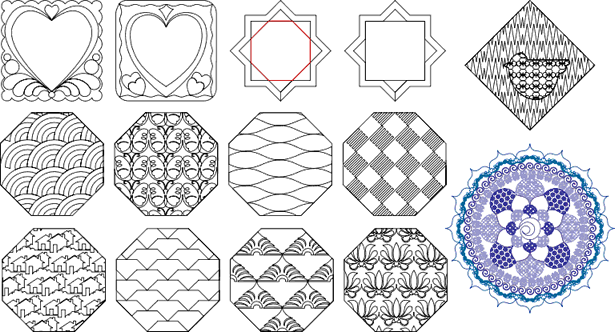 A couple of hundred Motif fills are included in Art and Stitch. That’s not enough - I know, so you will learn how to create your own Motif Patterns in this class. 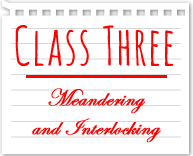 This class includes new functions introduced in Art and Stitch version 4.2. Important: This is an advanced Class. 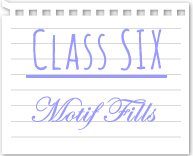 To follow this Master Class and make the Fillers Sampler, it's best if you joined our Stay @ Home Class FIVE about Creative Fills as well as Stay @ Home Class SIX about Motif Fills !